Need suggestions for your Spring/Summer Session wardrobe? I know, I know, that doesn’t sound very helpful. Your clothing choice depends on what you’re envisioning for your session. If you want relaxed photos, come in your favorite casual outfit. A little more formal? Maybe a new dress in a great color – then coordinating the other outfits around that. Whatever you choose, make sure it’s something you love wearing! I typically recommend choosing two colors and having them incorporated throughout different items of clothing or accessories. The goal is for your family’s wardrobe to flow without being too matchy-matchy. Think about colors that would pop against the Spring and Summer background. The days of dressing in matching white (or black) shirts and khakis are over, my friends! • Match your eye color. You’d be surprised how much this can do for your eyes! However, I wouldn’t recommend for your blue-eyed bunch to show up wearing head-to-toe blue. Moderation and coordination are key. Also, don’t forget how accessories can play a huge role with a pop of color! 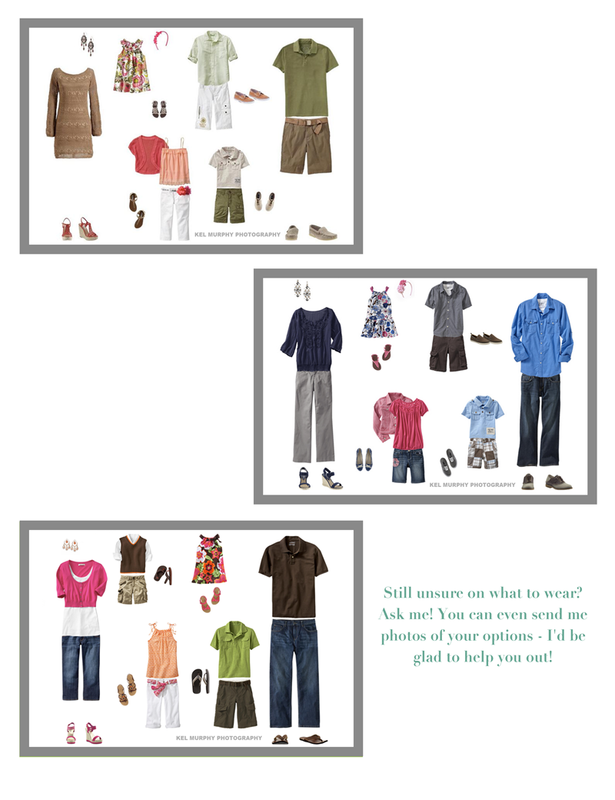 • Think about where in your house you want to hang your photos. You can match the colors of your outfits to your decor so that your photos will coordinate with that particular living space. • I’m a big fan of using gray in items of clothing – it always looks so great against Spring/Summer colored foliage in the background. This also allows for your clothing colors to pop, instead of trying to match the background. • Reds (pinks included) can be the most powerful color in images. If you wear red or red accessories, your eyes may be drawn to those items instead of faces and expressions. That’s not to say that wearing red is a big no-no – but I only recommend using it as a small pop of color, instead of an entire outfit or dress. • Neon and very bright colors are never a good idea – they do not photograph well. • Clothing with big logos, words and characters are not recommended. • When in doubt, neutral colors and earth tones are always great.